This intimate October wedding was just the prettiest, sweetest wedding ever. 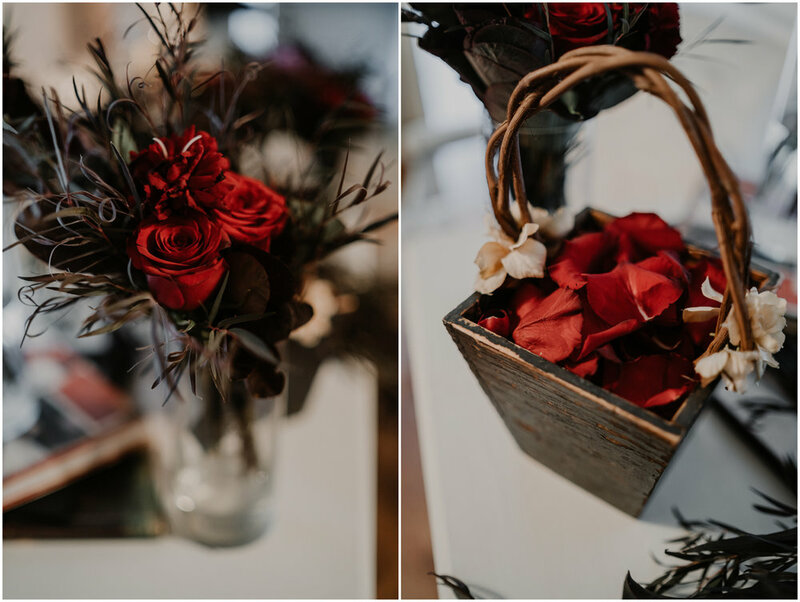 A super sweet couple, a beautiful fall color palette, the most elegant details, and some seriously gorgeous florals… we loved every second of this one. 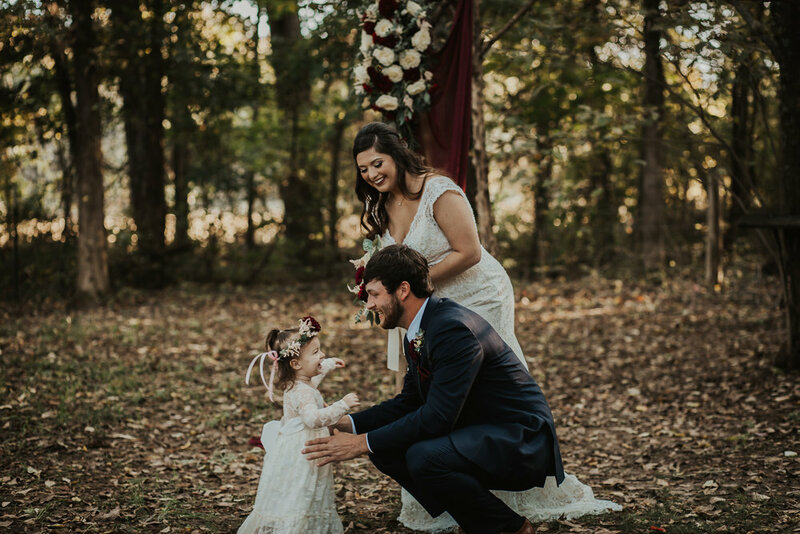 We’re absolutely swooning over these dreamy photos by Hannah Motes, who is the sister-in-law of the bride, and we know y’all are going to adore this one! Wedding videography is always a good idea, and we encourage our couples to work it into their budget if they’re able to! It’s truly the best way to remember every moment from your wedding day that you don’t want to forget - all the emotions, all the details, all the people who made your day so special. A video really captures the vibes from your wedding day, and we can’t recommend them enough. We LOVE Bailey and Mason’s sweet, romantic video from Blue Box Videography. Bailey’s florals were luxurious and beautiful, with white roses, deep red dahlias, a little bit of blush astilbe and greenery. They were simple yet gorgeous. The white ribbon tied around her bouquet was the perfect touch. “I asked for something simple and not too big and that’s exactly what I got,” she said. Bailey found her dream dress at David’s Bridal, and it was perfection. It had a gorgeous neckline, the prettiest lace, and a lovely silhouette. It was timeless and classic, but the plunging back kept it totally modern. You were the most gorgeous bride, Bailey! Bailey and Mason’s ceremony was intimate and dreamy. Their altar was so romantic, with burgundy drapes and lush florals. Their aisle was lined with wire sconces filled with burgundy and white flowers, and they had a simple, adorable guestbook table with a small floral arrangement and a spot for guests to drop their written well wishes for the couple. How precious is this family?! Bailey and Mason had a cake cutting inside The Barn, and it was romantic and so dreamy under The Barn’s gorgeous lighting and draping. How magical does this look?! They had the cutest little cake ever. I never get tired of this style of cake… super simple with a few beautiful flowers. Perfect! 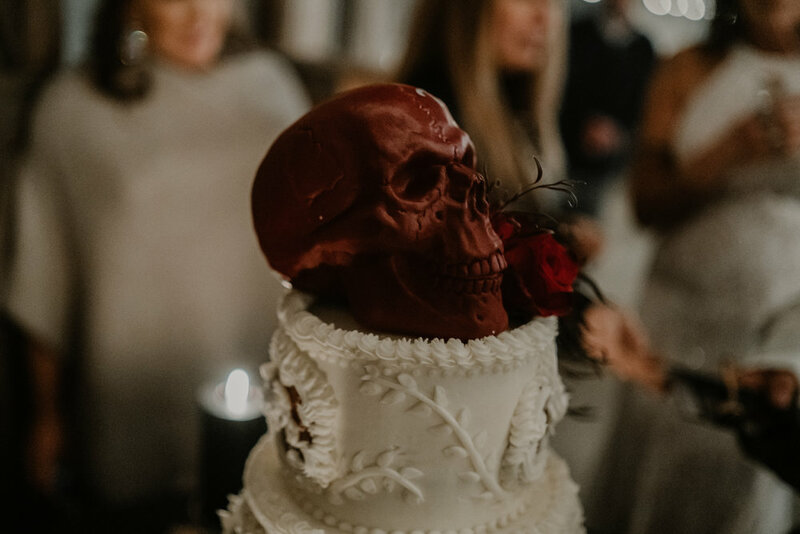 It's obviously super important to pay attention to the big details of your wedding: the altar, aisle, florals, cake, reception tables... All the things your guests will pay a lot of attention to, and things that will be highly photographed. But if you ask us, all the little tiny details in between are what make your wedding day all your own. 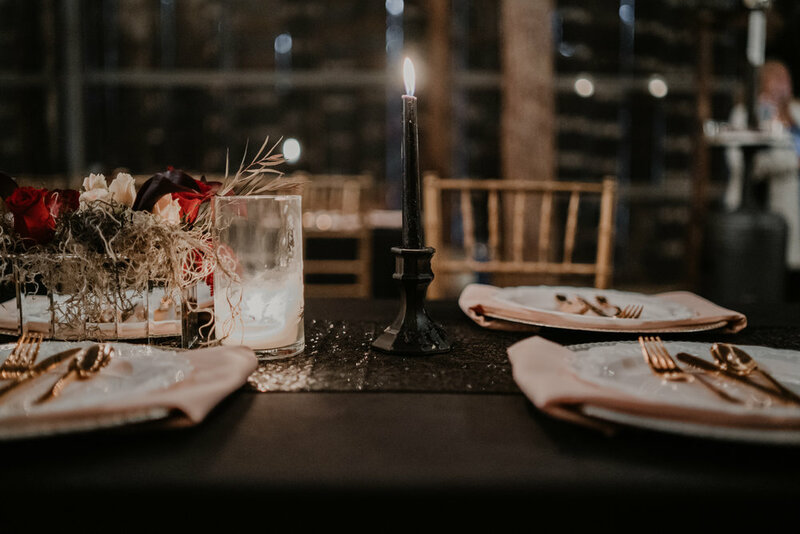 I'm talking about things like: the tiniest details of your place settings, down to the straws and napkin holders; pretty guestbook table details; and things that add just a touch of personality throughout your wedding decor. Although these items may be small, they all add up to create a look and theme that is customized just for you! One great detail that we love to incorporate into ceremony and reception decor: signage! Signs for the ceremony, reception, menu and bar... Chalkboard signs, hand-lettered signs, painted signs, pallet signs, and everything in between! At The Barn, we take our signs seriously! Some of our most photographed details at The Barn are our signs... The ones lining the road to The Barn, our "espresso and a puppy" sign, and the "I do's, we did's" sign by the ceremony site. Here are some gorgeous signs, from weddings at The Barn and around the web! Bridal Musings; Style Me Pretty. Amazing florals take pretty signs to a whole new level! Tryston Hines Photography, from Jaime + Jake's wedding. A hand-lettered chalkboard sign in a pretty frame made Jaime + Jake's lemonade bar complete! Melissa McCrotty Photography, from mine + Richard's wedding. I made several signs for our wedding, including this chalkboard sign that we used instead of wedding programs! I have TWO gorgeous weddings to share with y'all this week! They're both throwbacks, and they're both uniquely gorgeous. Seriously can't wait for y'all to see these two! Happy New Year! We’re so excited that our first post of the new year features one of our very favorite weddings from last year! We’ve dubbed this our “longhorn wedding,” and if you know us at all, you know this was right up our alley! 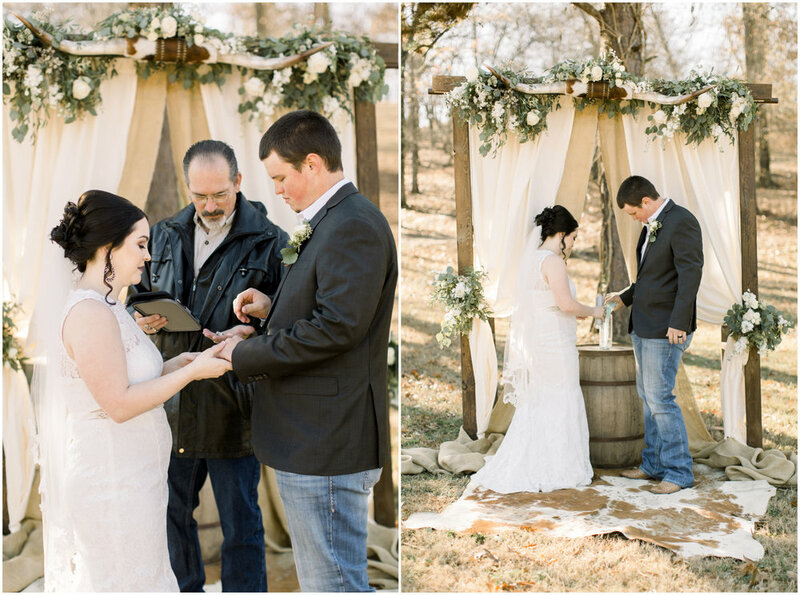 This sweet couple was another of our beloved Kingfisher couples, and it made our month that they drove all the way from western Oklahoma to get hitched at The Barn! Tanner just so happens to be Matt’s son, and he and Autumn tied the knot just one weekend after Matt and Erica were here! Autumn got ahold of us on a Friday and asked if they could get married on Sunday… as in two days later. It was kinda crazy, but we LOVED this gorgeous wedding and this couple! 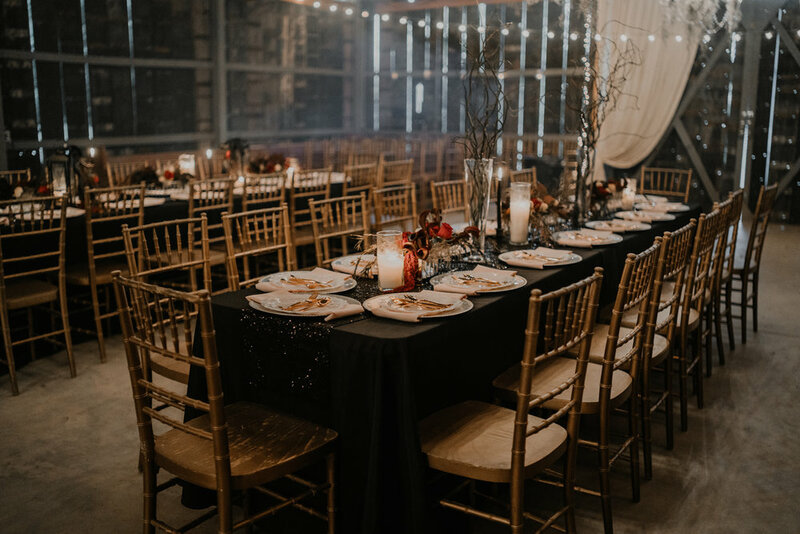 Crystal Malloy Photography captured this wedding so beautifully - she’s pretty much the official photographer for our Kingfisher couples, and we’re always obsessed with her work. 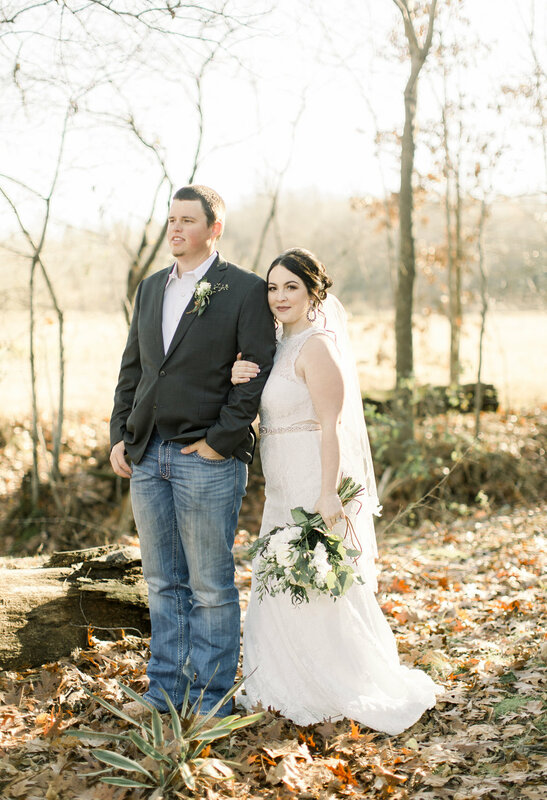 Autumn and Tanner were married at The Barn at Twin Oaks Ranch on December 9, 2018. Their color palette was full of whites and greens. 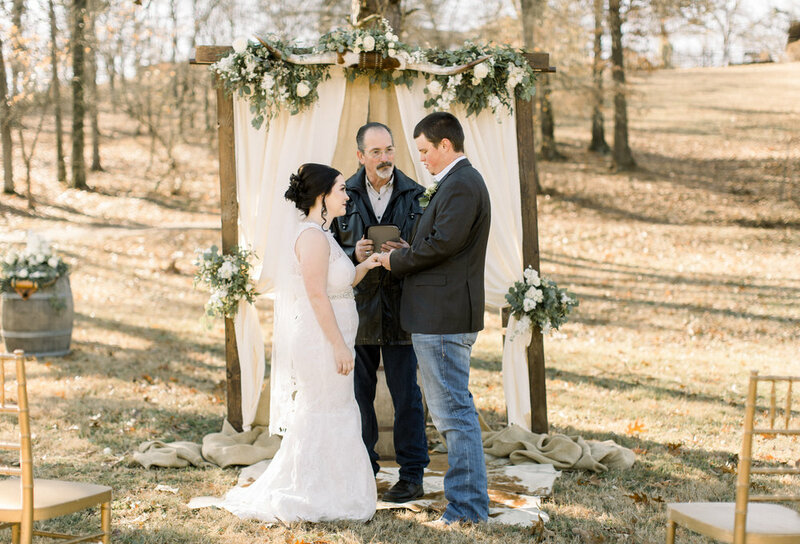 They chose a rustic, ranch style theme, and many of their details were also classic. It was just SO pretty and perfect for The Barn’s surroundings! Autumn was the prettiest bride ever, y’all. She wore a classic, timeless dress from David’s Bridal, and we loved every part of it - especially the gorgeous lace neckline. She wore beautiful, classic accessories, including a gorgeous pair of earrings, the prettiest sash around her waist, a stunning veil trimmed with lace, and a great pair of boots. Autumn, you were absolutely glowing! We loved this beautiful mama getting ready for her wedding day while holding her adorable baby boy! 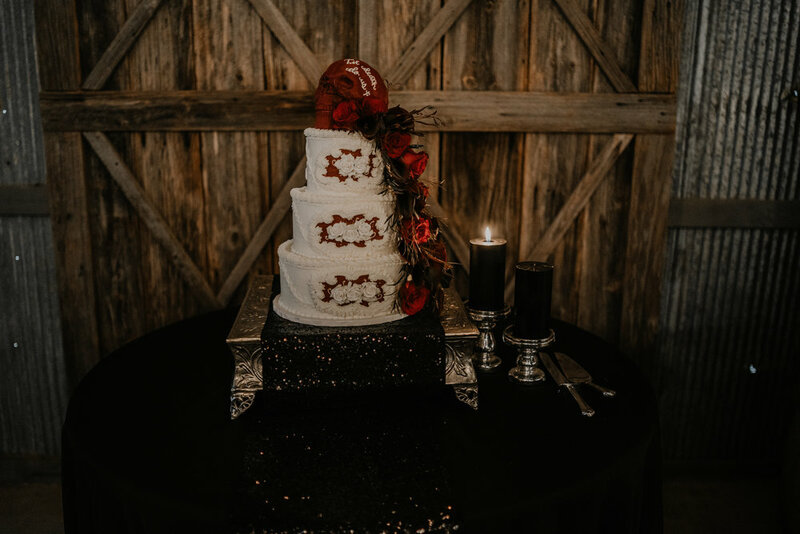 At The Barn, we LOVE our longhorns, so we were thrilled when Autumn and Tanner wanted longhorns used throughout their decor. We were CRAZY about this longhorn altar! 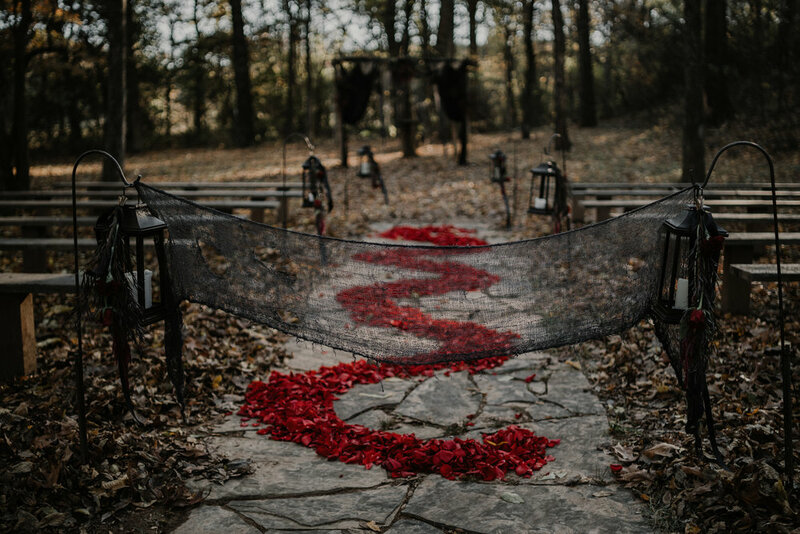 Autumn said that was one of her favorite details, and it made their ceremony so unique and personal. 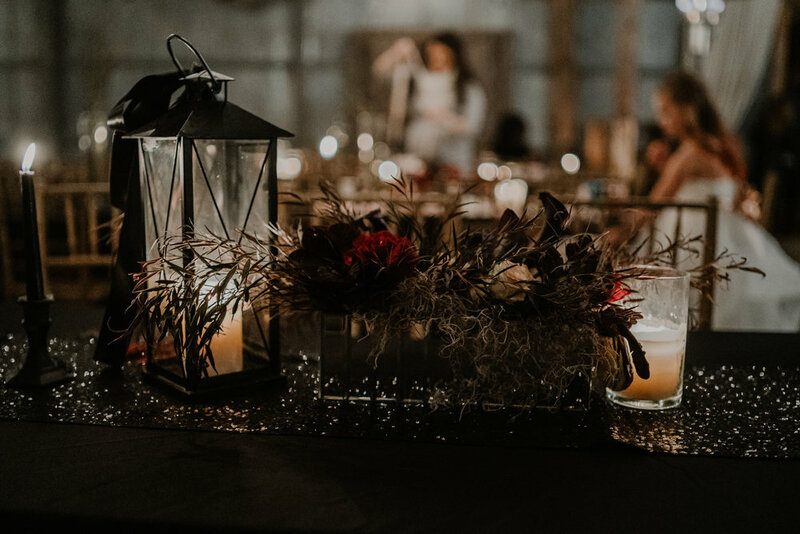 In their altar setup, we also included ivory and burlap drapes, white flowers and lots of beautiful greenery, an old whiskey barrel, and of course, the Kingfisher cowhide. (If you don’t know, our Kingfisher couples love to tie the knot while standing on this thing, so we’ve officially named it after them! ;) This ceremony was just SO pretty. We can’t get over it! Crystal takes the best portraits of her couples, and we are swooning over these. They are incredibly romantic and beautiful, and I just can’t get over how lovely it is out here even in December! These two make such a gorgeous couple… get ready for some serious eye candy! Their white cake, topped with and surrounded by white roses and the loveliest greenery, matched their other details so perfectly - it was simple, rustic and totally stunning. We sat it atop an old whiskey barrel, and of course we added more longhorn details! Gosh, this cake display was so pretty. 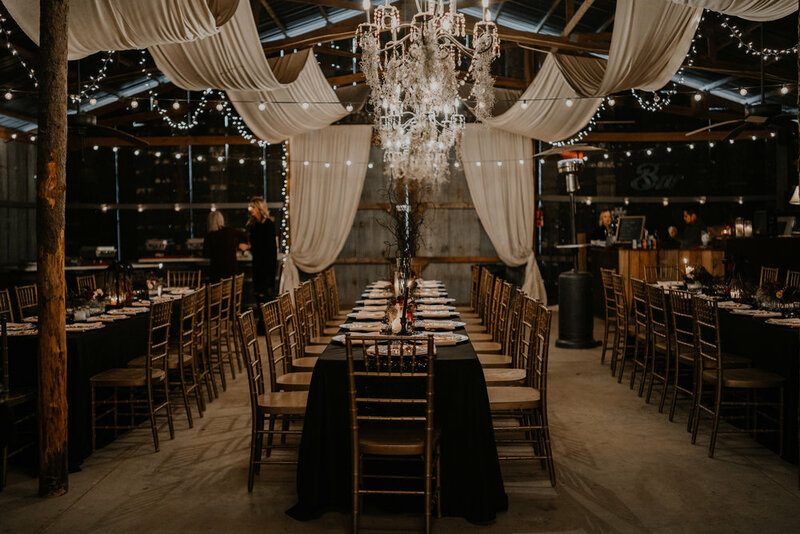 The newlyweds shared their first dance as husband and wife inside The Barn, just the two of them, and it was incredibly romantic under the chandeliers and sparkling lights. This is one reason why elopements are the best! SO insanely romantic.